The Volkhov Hotel located in the very heart of Veliky Novgorod, within a 2-minute walk from the Novgorod Kremlin and the main sights of the city. 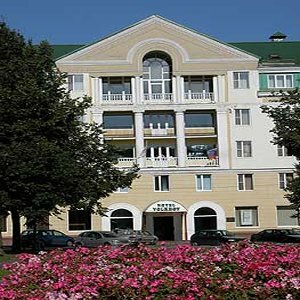 The hotel's convenient location in Novgorod centre allows guests to walk and explore the city. The hotel offers 123 rooms of various categories. All guestrooms are equipped with comfortable bed, chairs, working area, luggage shelf, coat rack, telephone, LED TV-set, mini-fridge, Wi-Fi, bathroom with shower, towel set and toiletries. Every morning guests are welcome to breakfast, also, there are lunch and dinner at the hotel. The Volkhov restaurant for 100 people serves dishes of European and traditional cuisine. Two banquet halls for 12 and 30 people operated at the hotel. Lounge Cafe located on the fifth floor. The Cafe is suitable for negotiations and business meetings. The hotel provides 2 conference halls for up to 65 people and a meeting room for conferences, seminars and workshops. They are fitted with all the necessary modern equipment. Coffee breaks, buffet tables, lunches and dinners are available for participants of business meetings. Guests of the Volkhov hotel are welcome to dry Finnish steam room with alder and cedar walls, mini swimming pool with modern filter system, spacious rest room. Guest services are guarded parking, cloak room, safe, 24-hour information desk, taxi call, laundry/dry cleaning, library, billiards, souvenir shop, ATM, visa support, room-service, catering, hairdressing, beauty salon, Wi-Fi, excursions around Veliky Novgorod, transfer.